Donald Trump and Melania visited the Al Asad Air Base in Iraq on Wednesday, Dec. 26, 2018. It was the President's first visit to a military base in a war zone. While there, the President and First Lady shared a rare public kiss. What follows is a nonverbal analysis of that kiss as captured in the accompanying photograph (and the cropped close-up below). Most children can probably tell you that Donald's and Melania's kiss-embrace does not look to be at all affectionate. Note how Donald Trump is leaning quite far into the kiss. 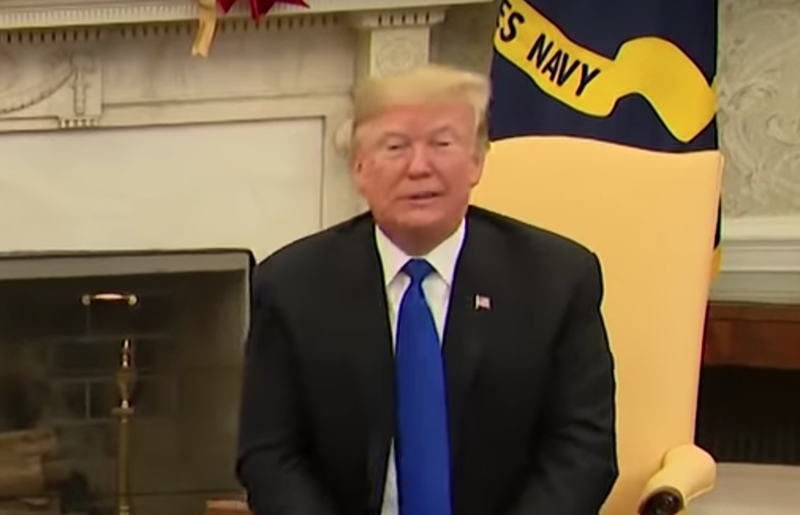 He is leaning forward 20º - 25º, while Melania is leaning in only about 5º. Whenever affection is lacking or diminished - and one still feels socially obligated to kiss or hug another person - one or both people will virtually always lean forward. The President is a fair amount taller than his wife (His true height is about 6' 0.5" [add another 1" with his shoes], while Melania's actual height is about 5' 6" [and with about 2.5 inches more in her boot heels]). Thus, although both can lean-into a kiss, with all other factors being equal (which may or may not be), the taller person typically leans further into a kiss or hug. Notice too, the angle of their heads and necks - each of their heads are tilted backward, away from each other. Moreover, affectionate embraces will have very frequently exhibit contact of the forehead, temple, and/or region around the eye with these same regions on the other person's face/head. You may have also noticed that Donald Trump's torso is twisted a bit toward the audience. While Melania's torso and stomach are pointed directly at her husband, his are rotated to his left. Full body pointing is a signal of affection and/or respect - while not doing so indicates a lack of thereof. Full body pointing (eyes, face, chest, stomach, pelvis, etc. ), of course, also includes the feet. And, while we can't see them directly (and therefore, cannot discern where they're pointed), we can infer with fairly high accuracy, that her feet are directly beneath her center of mass - while his left foot is considerably further back compared with his body. Leaning into a hug or kiss allows the lower body to be further away from the other person - insulating them from intimacy. In such pseudo displays of affection - the further two people's feet are from their hugger, the less affection is present. Note that Donald's and Melania's pelvic regions and chests are far apart. Holding each other's upper arms, as they each are doing, ensures such body distancing. 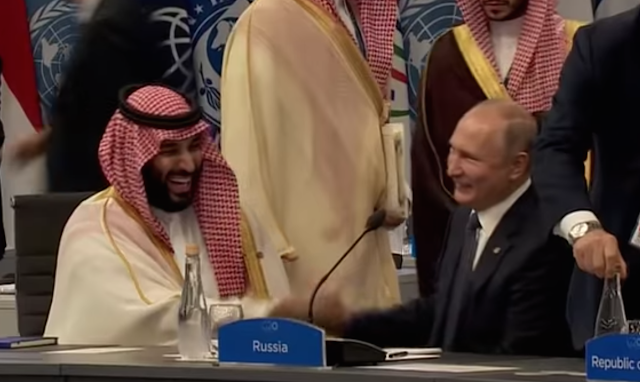 It's interesting to notice that both of their hands are not relaxed. His grip appears to be relatively tight - and this is, in part, due to his center-of-mass being considerably forward (he's a bit off-balance). 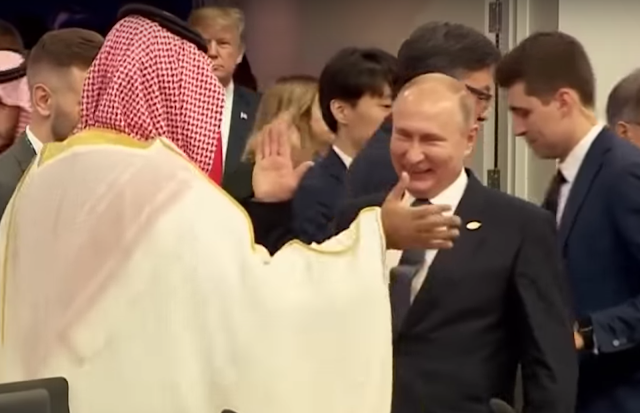 Sometimes gripping another person's arm in the midst of a hug or kiss is not at all affectionate and can be even a signal the presence of objectifying and/or narcissistic personality traits. There is not enough information in this one image to draw those conclusions, however. The First Lady's fingers and thumb are all quite widely splayed. This finger position signals a high adrenaline state - and while, kissing on camera with all the world watching (albeit, tape-delayed) is not the perfect environment for intimacy, the First Lady's fingers are not what we would, at all, expect to see amidst even a mild affection display. Her fingers betray her anxiety. Thus, while his hand-fingers are contracted - hers are widely extended and splayed. Neither of their hands are relaxed - but configured oppositely. Fascinatingly, when one's hands are tense, the face - particularly the mouth - is almost always tense too. Kissing styles (whether a peck, a longer lips-only kiss, a French kiss, etc. ), vary from person to person, but it's also quite true that, like the leaning-in of the body, the further the lips protrude forward, the less affection exists. 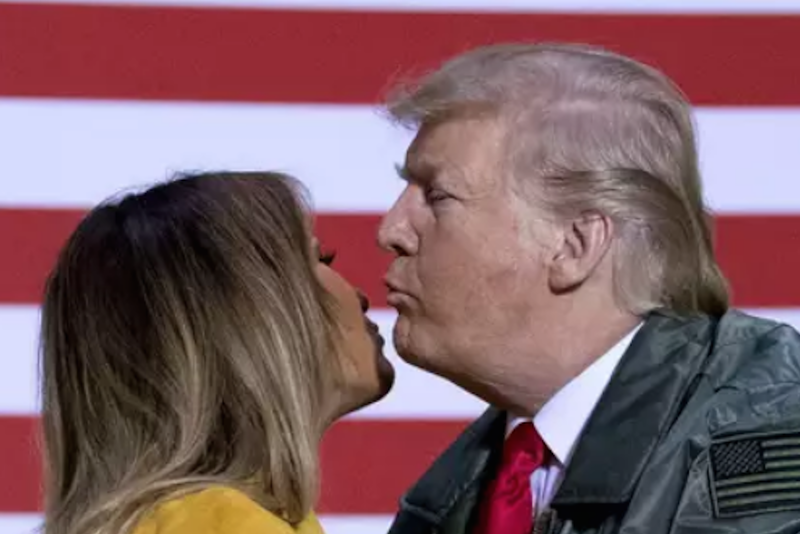 Another obvious (nay, glaring) characteristic of this kiss's lack of affection is Melania's turned cheek. This kiss is not even a lip peck. Between spouses, this simply screams. 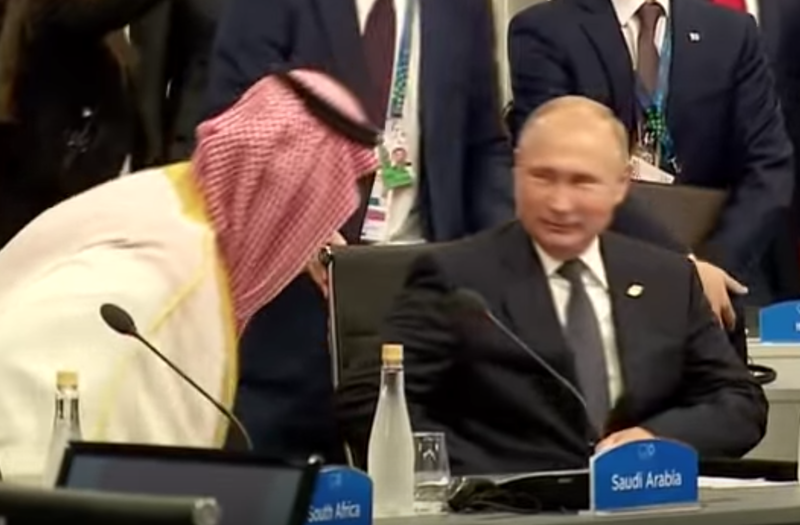 This nonverbal signal is so overt and ingrained in our culture that this dynamic is a millennia-old metaphor for dissing, distancing, disrespect - signaling an absence of affection. The President's eyes (eyelids) appear to be slightly open - his lower eyelids are relaxed which strongly suggests such lack of closure. Melania's right eye may also be a bit open, although given her head rotation, this is impossible to tell. 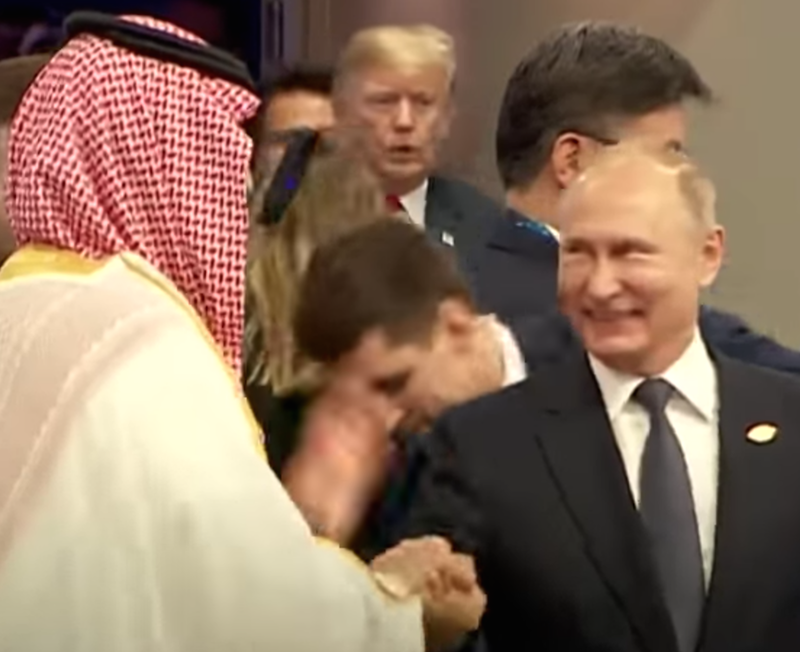 When affection is present, there is a strong tendency toward eyelid closure - although, in such public settings, many will also keep their peepers partially open. 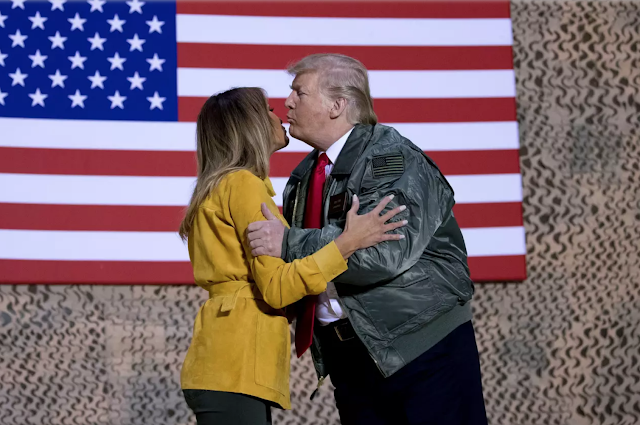 SUMMARY: Donald Trump's and Melania's recent kiss-embrace in Iraq is profoundly lacking in affection. And although very few us will ever kiss with the world watching, this display was light-years away from what one would expect of loving and affectionate spouses. 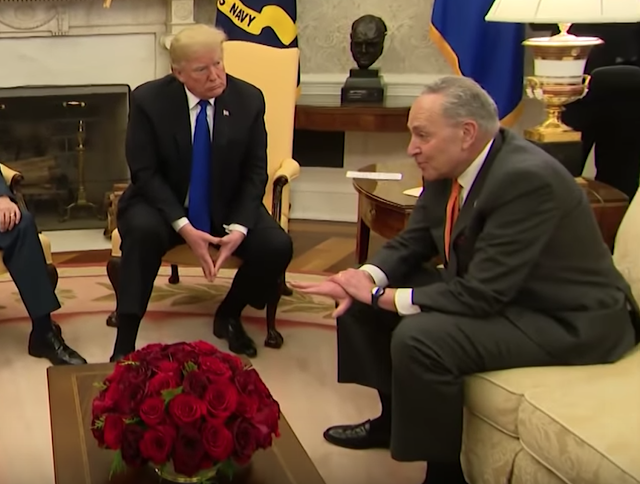 On Tuesday 11 December 2018, Donald Trump met with Nancy Pelosi and Chuck Schumer in the Oval Office. Among many things, President Trump said, "... If we don't get what we want - one way or the other - whether it's through you - through a [sic] military - through anything you wanna call, I will shut down the government, absolutely" and "I am proud to shut down the government ..." as well as "... I will take the mantle. I will be the one to shut it down ...". A partial shutdown of the federal government began on 12:01 AM on Saturday, 22 December 2018. The reason for shutdown arises from President Trump's insistence on 5 billion dollars to fund a border wall - a demand which the Democrats refuse. 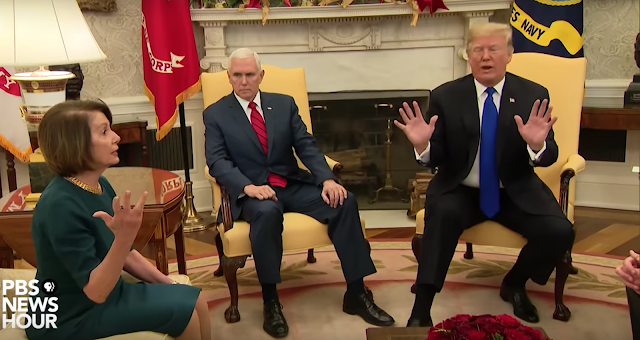 What follows is a partial nonverbal analysis of some of the behavior exhibited during this televised Oval Office meeting. During 5:33 just after he says, "Nancy, would you like to say something? ", the President displays a Tight Tongue Jut - signifying his disdain, disgust, and repulsion for the future Speaker of the House. 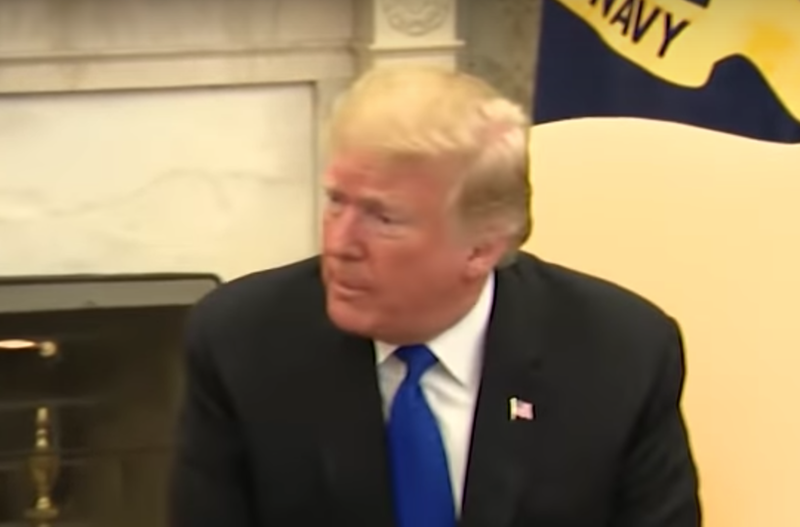 During 5:57, just after he repeats Nancy Pelosi's coined nomenclature, "The Trump Shutdown", the President displays a classic contempt expression. 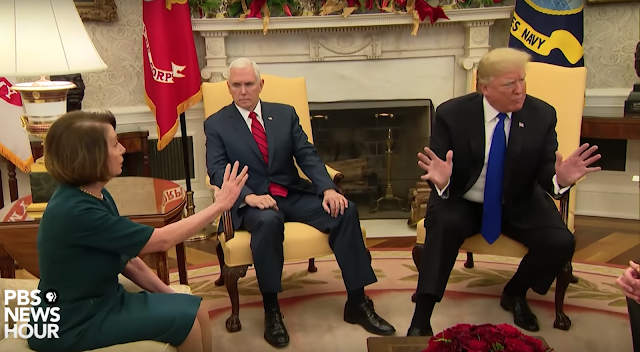 During 6:50, Donald Trump employs a common hyper-dominant nonverbal maneuver when interrupting Nancy Pelosi - an outstretched arm with a finger-spayed-palm-down hand gesture (illustrator). Note Pelosi's restraint - as she grips her right hand, holding herself back. 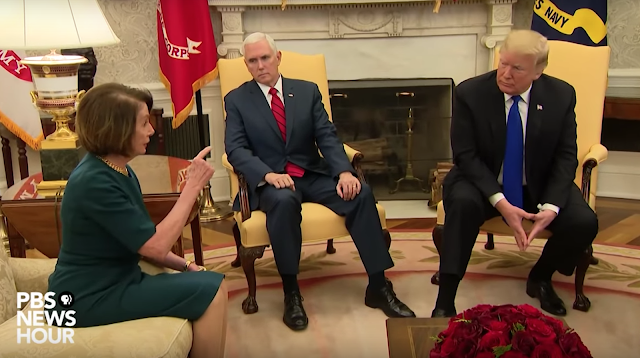 A few seconds later (6:55), after interrupting Representative Pelosi multiple times, just after President Trump says "... Nancy, I'd have it passed in two seconds ...", Nancy Pelosi momentarily sequesters all of the fingers on her right hand - save one, her middle finger. This behavior is an excellent example of what is known as a Partial Emblematic Slip. (Partial, because the straightened middle finger is not in it's usual, full-fledged-arm-held-upright position. Emblematic, because the meaning of an extended middle finger is known the world over. And Slip, because it's a subconscious act). In this moment, the future Speaker of the House is very much (albeit subconsciously) flipping off the President in the Oval Office. Beginning at 6:54, Trump says, "It doesn't matter though because we can't get it passed it the Senate because we need ten Democrat votes, that's the problem". 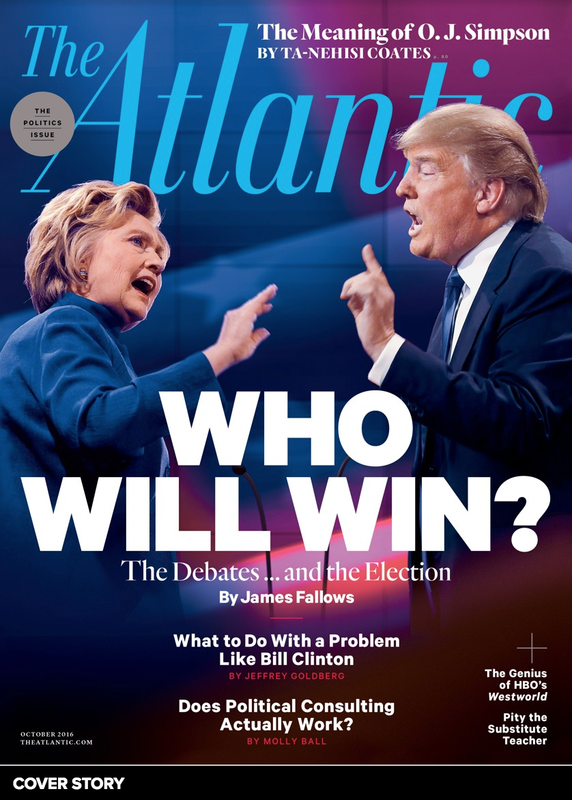 Then, during 6:58, as he says the word, "votes", Trump falsely adjusts his suit jacket with his right hand. This signifies the President's anxiety - and more specifically, an anxiety-provoked attempt at alpha up-regulation. Another way to think of this is we are seeing an alpha personality, who is temporarily more beta - and he's trying to dial himself back up to his alpha status. Once again, it's crucial that this is occurring in the Oval Office. 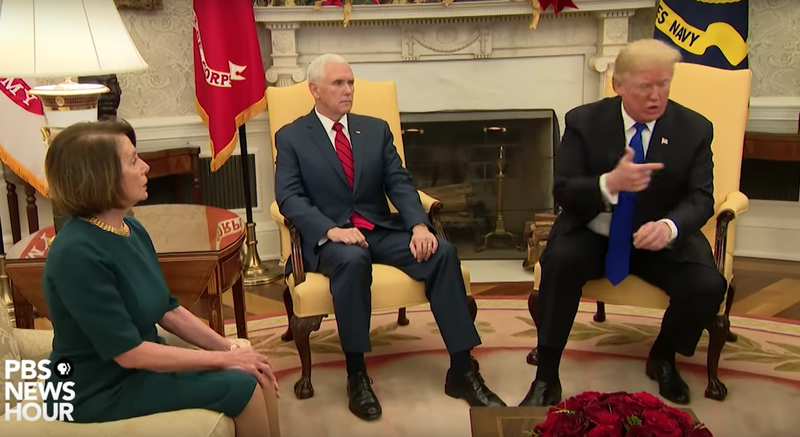 During 7:36, just after President Trump says, "Okay, let me ask you this - and we're doing this in a very friendly manner", Nancy Pelosi displays an insincere mouth smile as she also closes her eyes (eyelids). 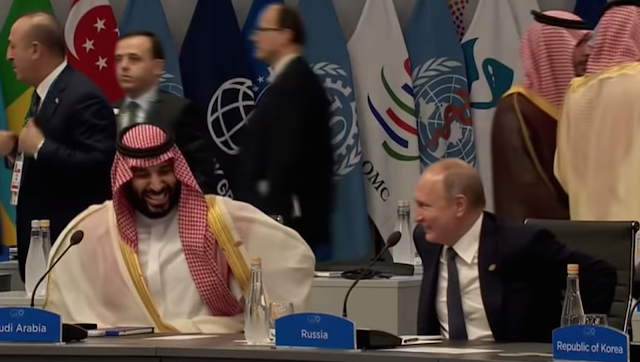 This is dismissive - and signals strong disagreement with the President's assertion of conducting himself in a "friendly manner". Note the President uses the contraction, "we're" - when it is him alone who is "doing this". Such language is an excellent paralanguage tell (statement analysis) of what is known as Diffusion of Responsibility or Forced Teaming (de Becker) (a manipulative technique Trump uses often). 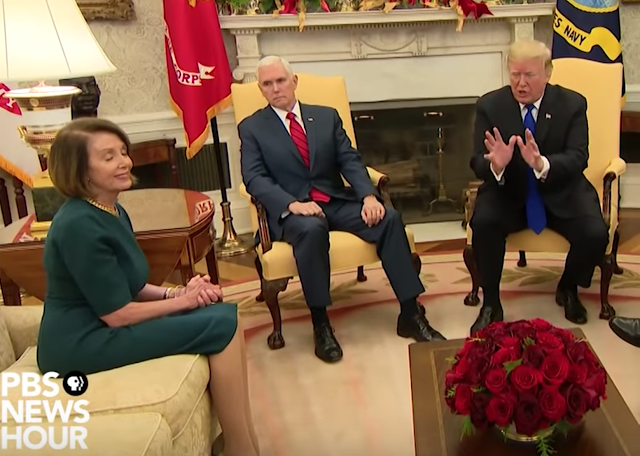 Beginning at 8:02, after Pelosi says, "The fact is you do not have the Votes in the House", Trump begins his retort, "Nancy, I do ...". Note that during 8:04, Pelosi's palm-up gesture is simultaneous with Trump's palm-down configuration. Her body language is much more rapport-building - while his nonverbals are rapport destroying. At 8:14, Trump says, "People are pouring into our country, including terrorists" - he gestures with his index finger (aka forefinger). 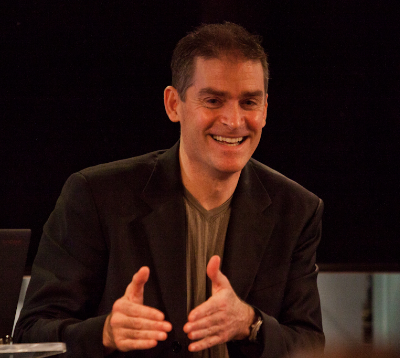 Notice that other fingers are not fully retracted. This alone demonstrates a lack of conviction. 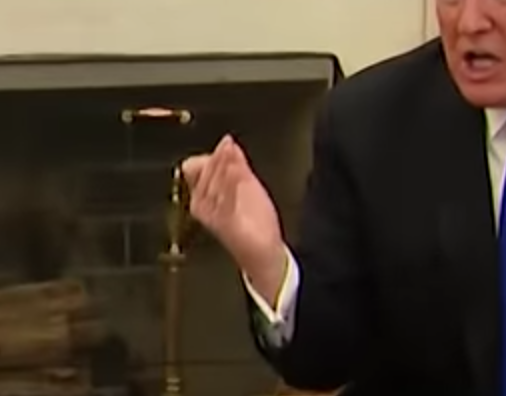 Then, during 8:17 - 8:18, as he says, "We caught ten terrorists over the last very short period of time", Trump contracts his right index finger, when only seconds before he had been pointing with it with the other fingers curled. This sudden change in dynamic (the complete opposite digit configuration) strongly telegraphs his deception. Trump completely lacks confidence in what he just said as he retracts the most dominant digit of his dominant hand. 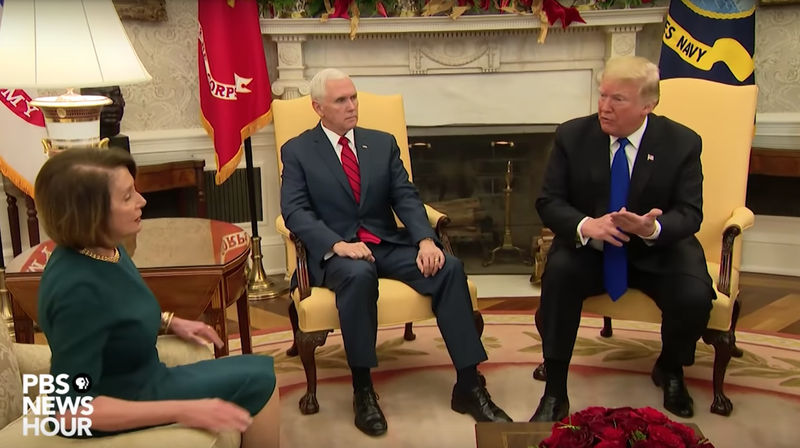 During 8:23, Donald Trump extends his right leg moving closer to Nancy Pelosi and sits closer to the edge of his chair. 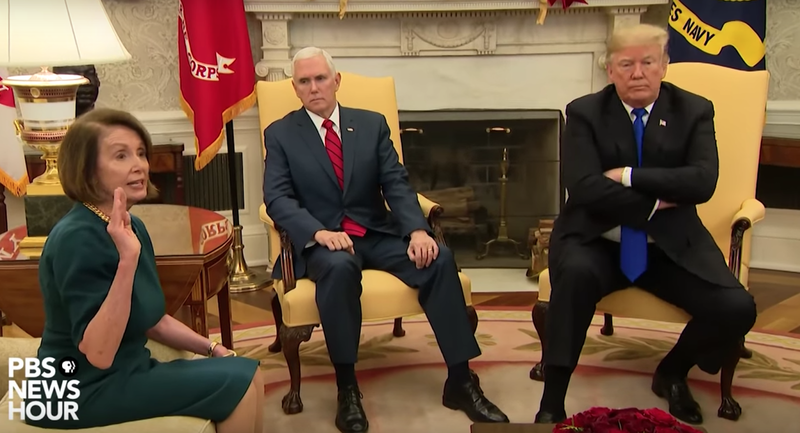 This aggressive posture and alpha dynamic cause her anxiety as she leans away from him and she repositions herself on the sofa. During 8:33 the President says, "We need border security of which the wall is just a piece, but it's - important". 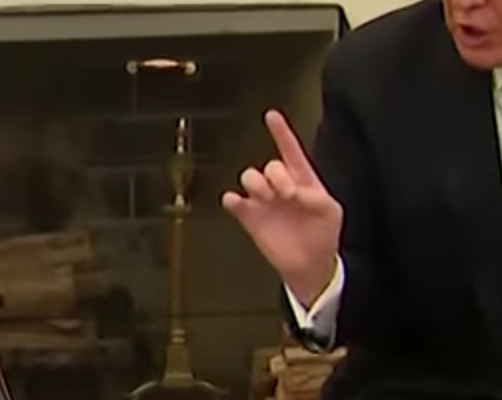 During the end of his sentence ("but it's - important"), Trump displays a hyper-alpha, double index finger point. And as Nancy Pelosi begins to speak again - he cuts off her response by immediately pointing to Senator Schumer with his right hand saying, "Chuck, did you want to say something?" 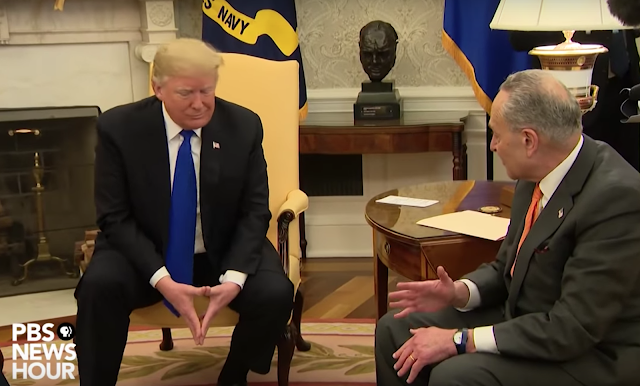 After Senator Schumer referenced The Washington Post, President Trump clearly displayed Contempt (8:54 - 8:56). 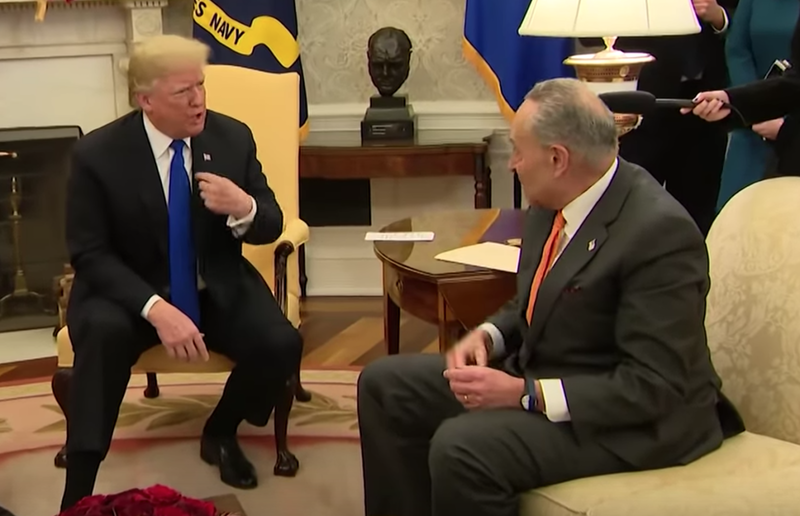 Donald Trump displays a Forward Lip Purse immediately after Chuck Schumer says, "We do not want to shut down the government" (8:58 - 8:59 - and later during 9:01 - 9:03, 9:16). Note Schumer then uses an Index Finger Point vectored toward the President, as he says, "You have called twenty times to shut down the government ...". 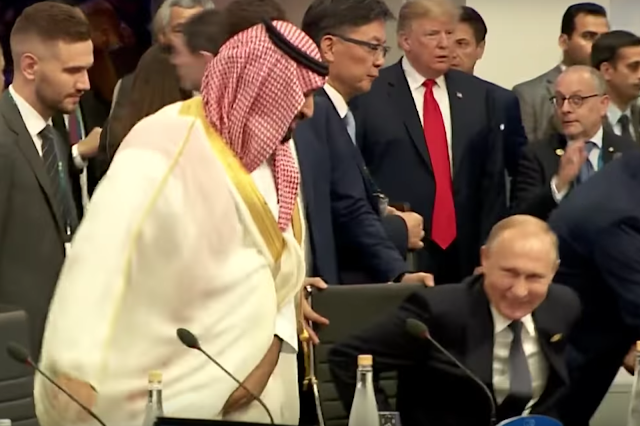 Trump telegraphs his thoughts every time he displays this body language behavior (something he does quite often). A forward lip purse indicates dramatic disagreement which is not being fully verbally expressed. Such disagreement is often quite clandestine. Their plans may be disclosed only a moment later - but often not for days or weeks (or longer). A person who uses a forward lip purse views themselves as the unequivocal alpha in the room. Additionally, anyone who uses this lip dynamic believes that they have a good chance of being successful with their plans. The take-home lesson: if you see anyone use a forward lip purse - protect your flank. 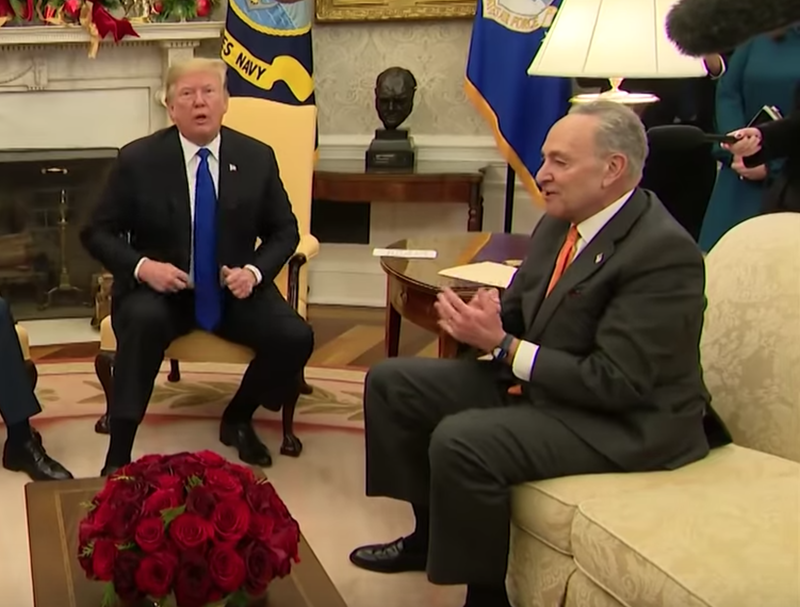 10:14 - Trump is projecting his hands forward - forming a nonverbal wall between himself and his two adversaries - while Pelosi's hand right hand is open and upward (as she is speaking about keeping the government open) - and Schumer's hands are clasped in frustration. 10:17 - Pelosi then, defensively, pushes back against Trump with a similar palm forward gesture - although with a just a single hand. 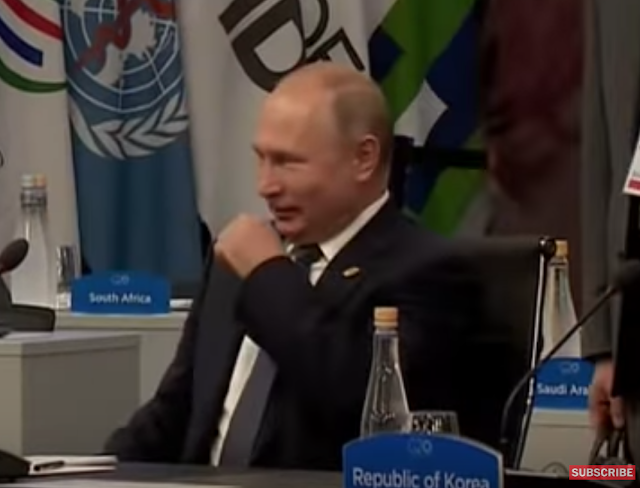 11:09 - Trump displays a bilateral False Jacket Adjustment with a simultaneous Loose Tongue Jut. By straightening his suit jacket when it wasn't needed - the President is attempting to up-regulate his alpha status (he feels relatively beta and believes he needs to dial up his alpha). This is very similar behavior to when a gorilla is beating on his chest. At 11:22 Sarah Huckabee Sanders can be seen displaying Contempt after Senator Schumer says, "and the experts say you can do border security without a wall which is wasteful and doesn't solve the problem." Beginning at 13:37 Trump continues, "... I also know, that ya know Nancy's in a situation where it's not easy for her to talk right now - and I understand that - and I fully understand that. 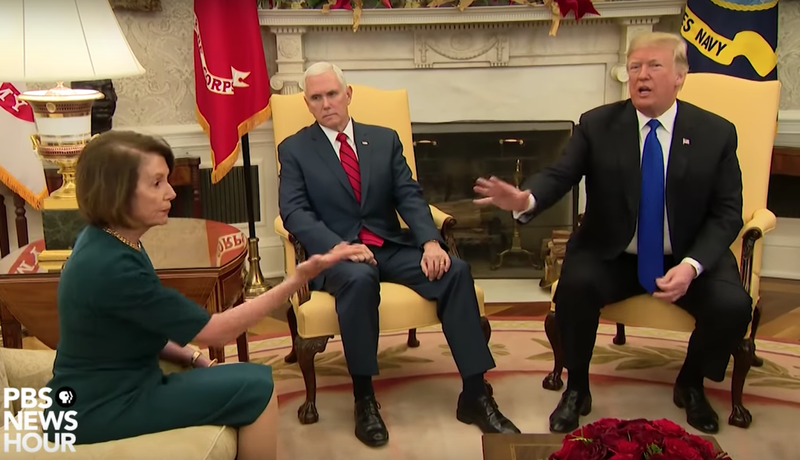 We're going to have a good discussion and we're going to see what happens ..."
Pelosi responds with, "... Mr. President, please don't characterize the strength that I bring to this meeting ..." - as she uses a Fingers-Together-Palms-Down gesture (13:54). 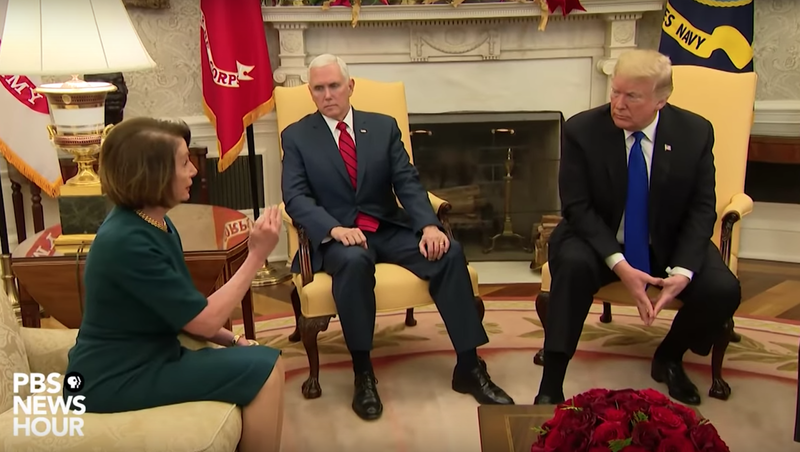 Pelosi then segues into an Aggressive/Alpha Index Finger Point as she continues, "... as the leader of the House Democrats" - while the President is simultaneously displaying a mild expression of Contempt. As Nancy Pelosi says, "... This is about the security of our country. 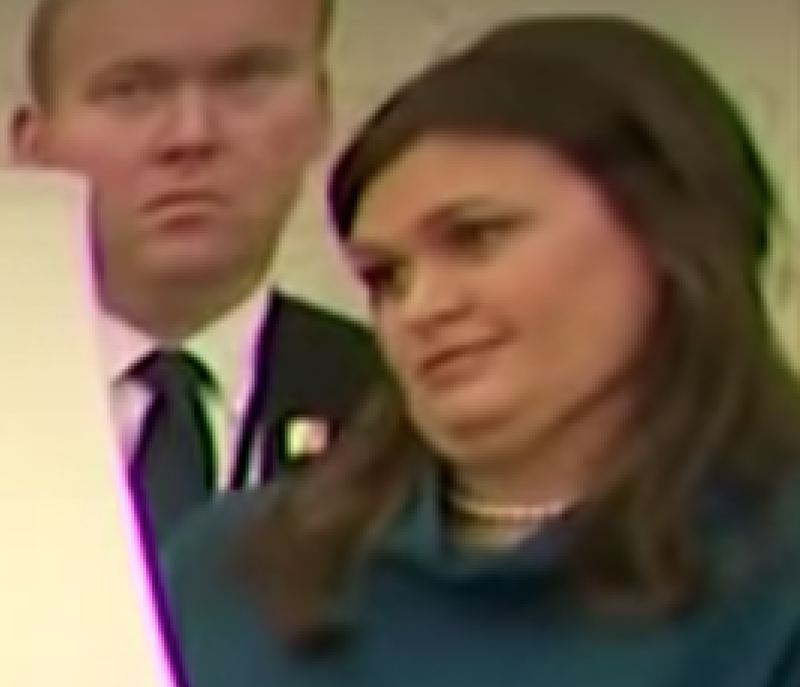 You take an oath to protect and defend and we don't want to have that mischaracterized by anyone ...", she also nonverbally reminds everyone of the Oath as holds her hand upright. 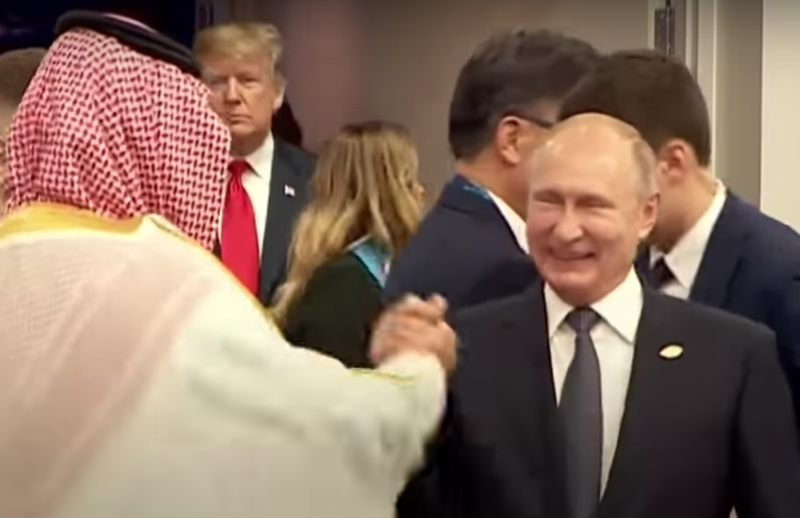 In addition, the President immediately looks downward - the direction of gaze most often displayed during guilt and shame. 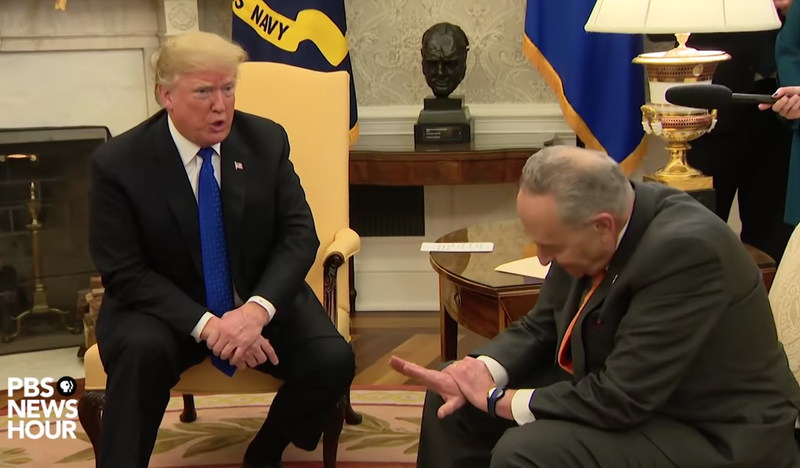 Senator Schumer grips his right wrist with his left hand (14:50) in a moment of self-restraint. As Schumer verbally refutes Trump - he displays what is known as a Pistol Steeple. This nomenclature is accurate not only because the hand configuration physically resembles a gun - but also because it's used when a person is in strong disagreement with another - metaphorically shooting down what they're saying/proposing (as Schumer says, "... No, no, no. Twenty times, twenty times, twenty times, you have called for ..."). 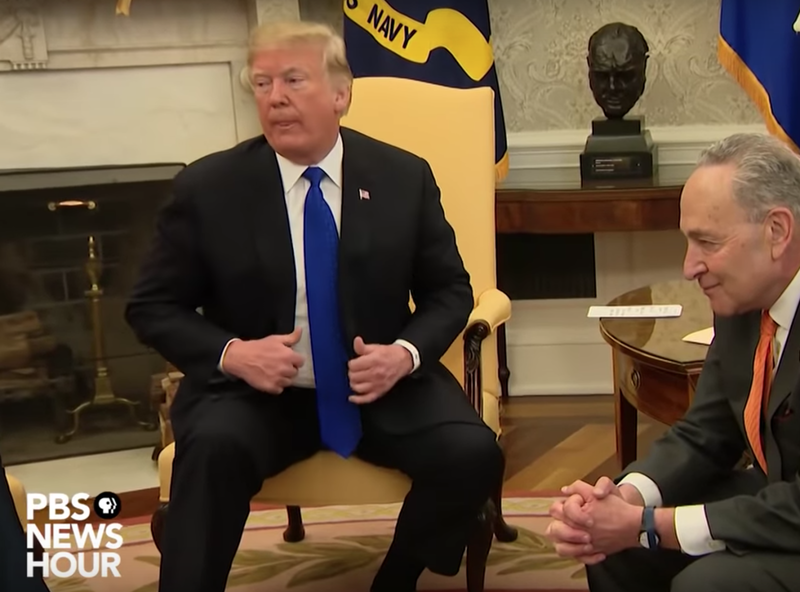 Schumer then pounds his right fist onto his left palm as the Senator quotes the President's threats to shut down the government (15:01 - 15:03) if he doesn't get his wall. Note that this makes Trump feel beta (again, while in the Oval Office) - and his psyche responds with yet another attempt at alpha-upregulation via a false jacket adjustment. ... and again during 15:07 - although this time he curiously points at his own throat. Throat pointing at oneself implies an ominous omen. As the President goes on to say, "You know what I'll say, Yes. If we don't get what we want - one way or the other - whether it's through you, through a [sic] military, through anything you wanna call - I will shut down the government - absolutely. And I am proud, and I'll tell ya what. 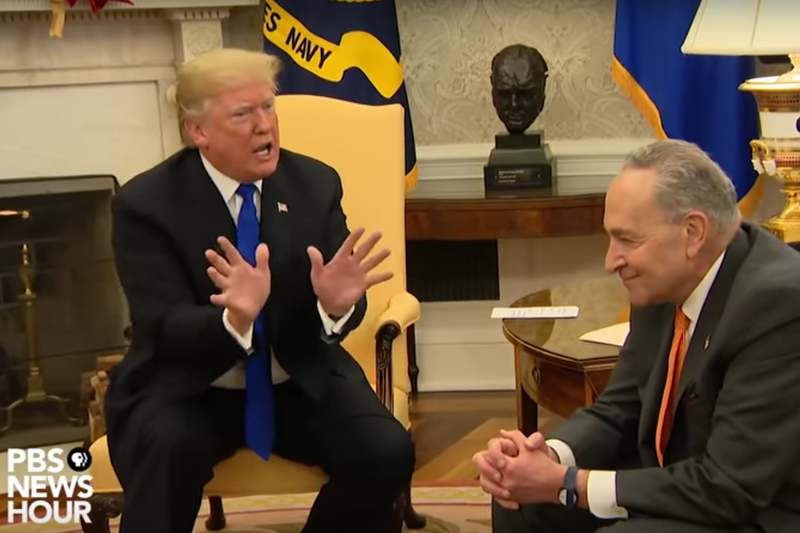 I am proud to shut down the government ...", Schumer again displays a self-restraining wrist grab - thus down-ratcheting his responses. 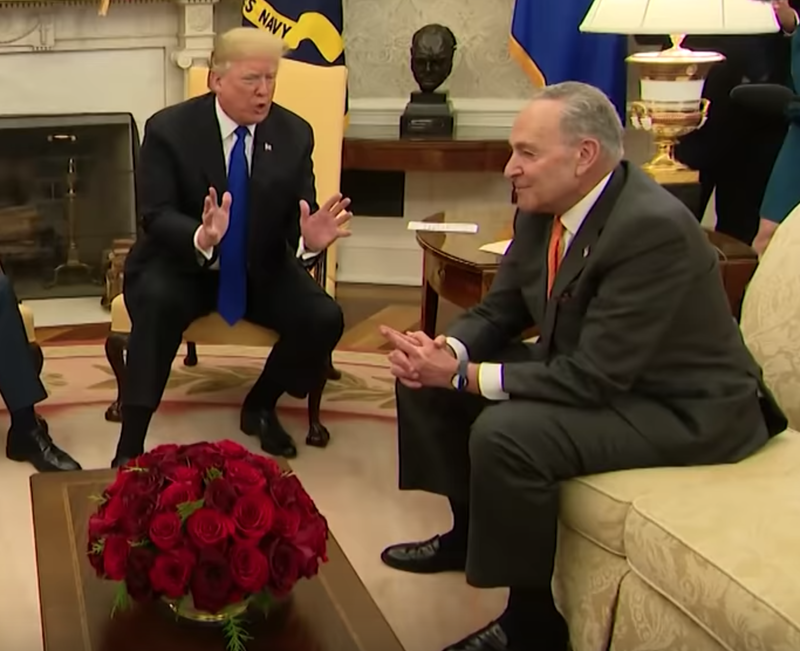 At first glance, a casual observer may think that Trump is holding his own hands in the same manner as Schumer - however, Trump's hand-clasping-hand display (rather than hand-grabbing-wrist) signifies a completely different set of emotions. The President, while in the Oval Office, is configured in what is known as a Fig-Leaf (aka Genital Guarding). 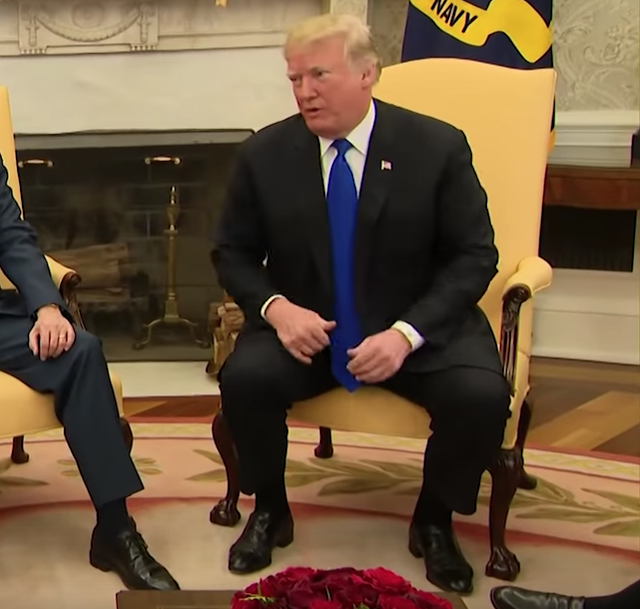 This is a significantly beta posture - for, despite the President's bluster, he feels vulnerable and in need of protection. 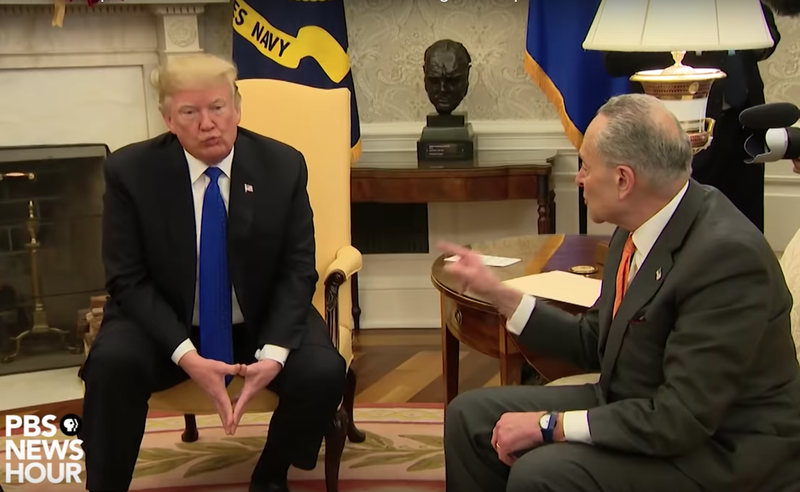 The President then goes on to say to Senator Schumer, "I will take the mantle" as well as, "I'm not going to blame you for it". 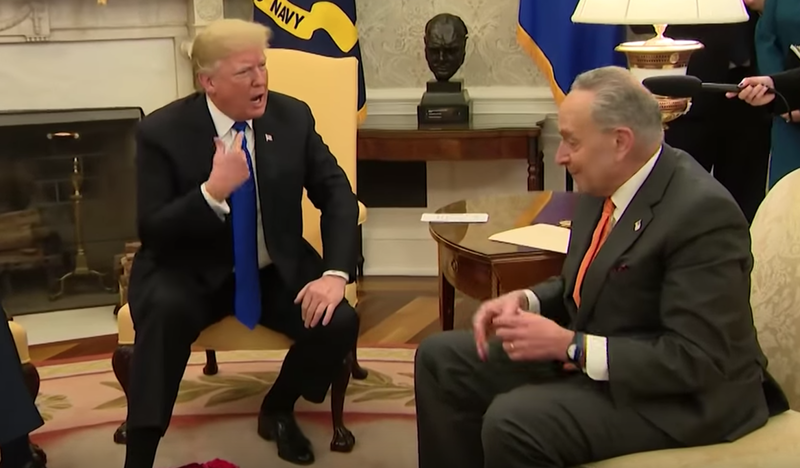 Throughout this last exchange with Schumer (15:19 - 15:48), Trump holds his upper arms close to each side of his torso. 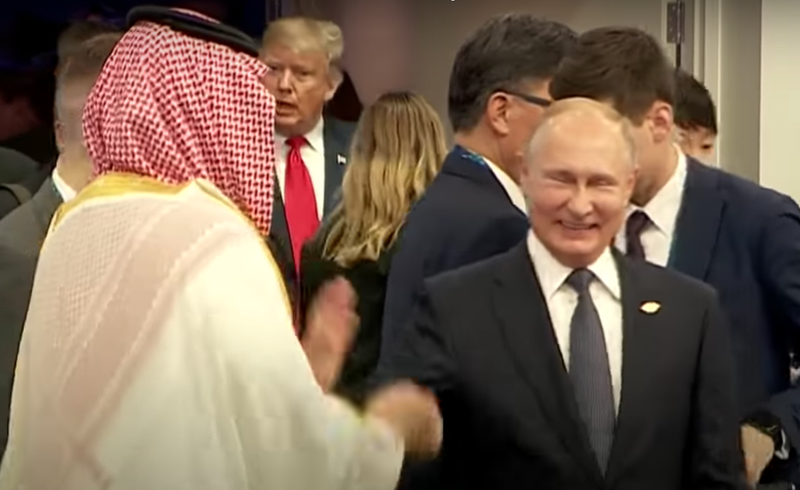 Trump displays this particular nonverbal behavior often - however, here it is particularly glaring. 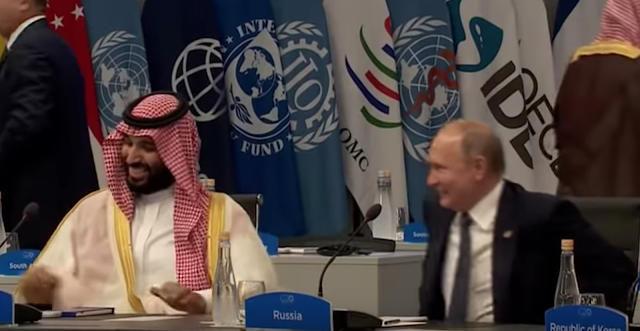 If he had sincere confidence in his statements, the President would hold his upper arms and elbows out several inches. 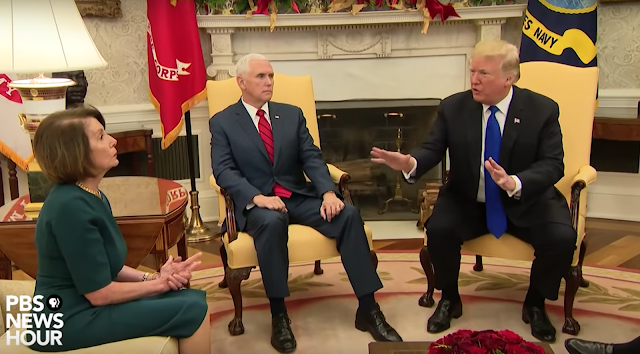 His words do not, at all, match his body language. 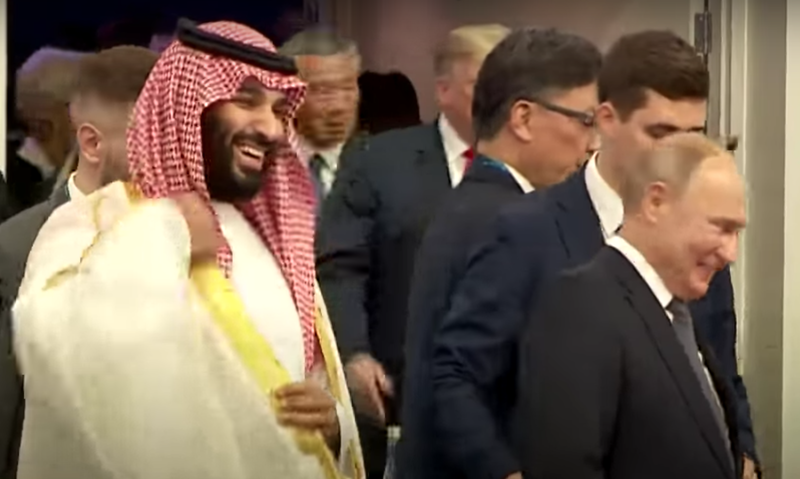 This beta posture once again betrays Trump's lack of confidence. SUMMARY: Donald Trump's nonverbal behavior clearly shows that he does, indeed, believe the wall is important - however, for his own political survival, not for the country's safety. During this Oval Office interaction, the President exhibited multiple beta emotional displays of low confidence, defensiveness, closed-mindedness. He also was being deceptive when said, "We caught ten terrorists over the last very short period of time". President Trump also fears Representative Pelosi a good bit more than he does Senator Schumer. Moreover, Trump thought Pelosi was the most skilled politician in the Oval Office on that day. Among other problems, Donald Trump has Impulse Control Disorder. And, whether Senator Schumer realizes it or not, he very much baited the President. Trump took the bait and quickly painted himself into a corner.